Provides cloud based protection from spam, phishing attacks and malware. Includes SonicWALL GRID Anti-Virus, SonicWALL Time Zero, Email Anti-Virus. Email spooling, per user junkbox, multi-LDAP server support. Comes with SonicWALL Dynamic 24x7 support. No on-premises installation required. Email continues to be vital to business communications and operations. However, as the volume of email increases, so too does the amount of ransomware, phishing, business email compromise (BEC), spoofing, spam and virus attacks. What’s more, government regulations now hold your business accountable for protecting confidential data, ensuring it is not leaked and ensuring the secure exchange of email containing sensitive customer data or confidential information. Also, email spoofing is on the rise. Spammers are falsifying email sender addresses to fool recipients while also inflicting damage to unknowing, legitimate brands. Protecting from the dynamic evolving email threat landscape while managing and maintaining an on-premises email security solution is costly and timeconsuming. As such, organizations can benefit from replacing legacy solutions with an easy-to-use, affordable hosted email security solution that easily integrates with existing email infrastructure, that can be quickly provisioned without upfront expense and that dynamically responds to new threats while reducing ongoing administration cost and complexity. SonicWALL Hosted Email Security offers superior, cloud-based protection from inbound and outbound threats, including ransomware, phishing, business email compromise (BEC), spoofing, spam and viruses, at an affordable, predictable and flexible monthly or annual subscription price. At the same time, it minimizes upfront deployment time and costs, as well as ongoing administration expenses. SonicWALL Hosted Email Security now integrates with the Capture Advance Threat Protection service, to deliver finegrained and user-transparent inspection of SMTP-based traffic. The cloud-based Capture ATP service can scan a broad range of email attachment types, analyze them in a multi-engine sandbox, and block dangerous files or emails before they reach your network. SonicWALL Hosted Email Security with Capture ATP gives you a highly effective and responsive defense against ransomware and zero-day attacks. The service also includes advanced compliance scanning, management and optionally, email encryption, to prevent confidential data leaks, regulatory violations and to ensure the secure exchange of sensitive data. Policies may be configured at the organizational level, to scan outbound email content and attachments for sensitive data and route email for approval or encryption. Encrypted email can be tracked to confirm the time of receipt and time opened. Intuitive for the recipient, a notification email is delivered to the recipient’s inbox with instructions to simply log into a secure portal to read or securely download the email. The service is cloudbased, with no additional client software necessary. Unlike competitive solutions, the encrypted email may be accessed and read from mobile devices or laptops. In addition, the service includes Domainbased Message Authentication, Reporting and Conformance (DMARC), a powerful email authentication method that helps identify spoofed mail, reducing advanced phishing attacks such as spear-phishing, whaling, CEO fraud and business email compromise. DMARC also reports on sources and senders of email, so you can identify and shut down unauthorised senders falsifying email with your address and protect your brand. SonicWALL Hosted Email Security is the only hosted solution to integrate multiple anti-virus technologies, including SonicWALL Global Response Intelligent Defense (GRID) Anti-Virus, SonicWALL Time Zero, and premium antivirus technologies, including McAfee, Kaspersky, and Cyren to deliver best-inclass email security. The SonicWALL GRID network performs rigorous testing and evaluation of millions of emails every day, and then reapplies this constantly updated analysis to provide exceptional spam-blocking results and anti-virus and anti-spyware protection. In addition, with SonicWALL Hosted Email security, there is no equipment to install on premises, eliminating upfront hardware and software expenses, and minimizing the time and resources needed to deploy and manage email security. Also, with a hosted service, there are no additional ongoing hardware or software updates, maintenance tasks or expenses. SonicWALL takes care of keeping the service up to date so you always have access to the latest features and most secure service offering, allowing you to free up IT resources to focus on other tasks. With SonicWALL Hosted Email Security, organizations get superior email security while reducing the administrative burden. SonicWALL Hosted Email Security is also available to MSPs and VARs interested in establishing a differentiated, highly profitable, email security software-asa-service (SaaS) offering for customers that delivers superior, cloud-based protection from inbound and outbound spam, phishing, zombie attacks and malware without incurring upfront expense or financial risk. With the addition of a hosted solution to its already extensive email security lineup, SonicWALL now offers VARs and MSPs a greater opportunity to compete and grow revenue while minimizing risk, overhead and ongoing costs. SonicWALL Hosted Email Security includes MSP-friendly features such as central management for multiple subscribers, flexible purchase options and automated provisioning. With SonicWALL Hosted Email Security, VARs and MSPs finally have a hosted email security solution from a security leader. SonicWALL Email Security Capture Advance Threat Protection Service detects and can block advanced threats until verdict. This service is the only advanced-threatdetection offering that combines multilayer sandboxing, including full system emulation and virtualization techniques, to analyze suspicious code behavior within emails, to protect customers against the increasing dangers of zeroday threats. And, the Email Security Capture now delivers finer granularity with more extensive file-type inspection, additional in-depth reporting capabilities, and a more streamlined and less obtrusive user-experience. 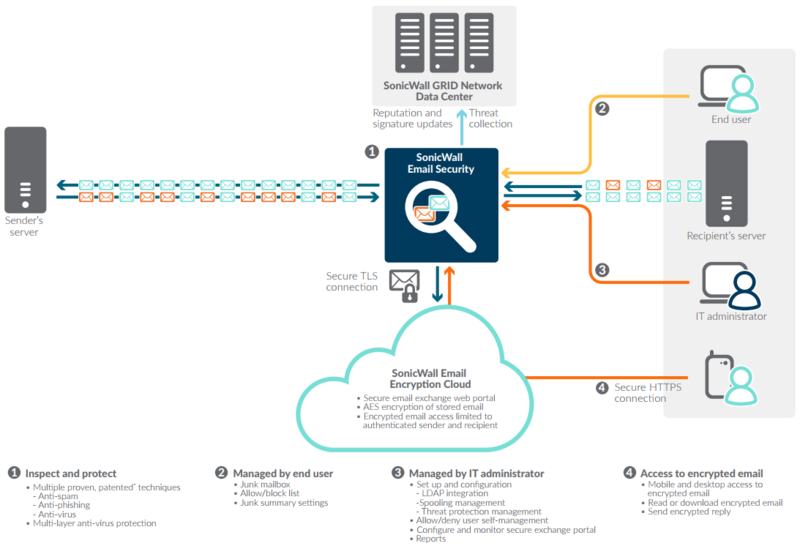 The SonicWALL Hosted Email Security service integrates with Office 365, to deliver a method for ensuring a correct/mapped message matching in a hosted, multitenant environment. In addition, Hosted Email Security supports the Automatic Office 365 IP address Allow List. Stop spam, phishing, zombie and malware attacks using multiple proven, patented* techniques including reputation checks that check not only a message’s sender IP reputation, but also the reputation of its content, structure, links, images, attachments. The technology also provides directory harvest attack (DHA) protection, Denial of Service (DoS) protection and sender validation. Advanced techniques are also used to analyze email content, such as a Support Vector Machine (SVM) algorithm, adversarial Bayesian filtering, image analysis and gibberish detection to uncover hidden known threats, and new threats. Outbound email scanning safeguards your reputation by scanning for - and blocking - traffic from zombies, unauthorised senders and email containing malicious viruses. Receive the most accurate and upto-date protection against new spam attacks, while ensuring delivery of good email, with real-time threat information from the SonicWALL GRID Network, which collects information from millions of data sources. The SonicWALL threat team analyzes that information and performs rigorous testing to establish reputation scores for senders and content, and identifies new threats in real time. Get multi-layer protection, including SonicWALL GRID Anti-Virus and premium anti-virus signatures, resulting in protection superior to that provided by solutions that rely on a single antivirus technology. 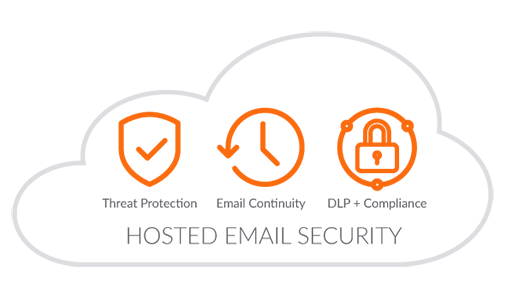 In addition, to prevent infection by new viruses before antivirus signature updates are available, SonicWALL Time Zero Virus Protection uses predictive technologies to identify email containing suspect new viruses and immediately quarantine it, safeguarding the network from the time a new virus outbreak occurs until the time an antivirus signature update is available. Comply with regulatory mandates by identifying, monitoring and reporting on email that violates compliance regulations and guidelines (e.g., HIPAA, SOX, GLBA, and PCI-DSS) or corporate data loss guidelines. With compliance policy management, you can configure record ID matching to easily search for predefined information and attachment scanning to stop the release of unauthorised information, You can also select from predefined policies to achieve easy compliance, including predefined dictionaries to ensure the protection of confidential information. Also, you can establish approval boxes for scanning and approving emails before release and enable policy-based routing of mail for encryption to ensure the secure exchange of sensitive data. Preserve network bandwidth by blocking spam and viruses in the cloud before delivering good email to the recipient mail infrastructure. Simplify end-user spam management by safely delegating spam management to end users. Users get the freedom to personalize the aggressiveness of their spam detection settings, while IT retains ultimate control over the overall level of security enforced. Increase efficiency and costeffectiveness by reducing your up-front deployment expenses, as well as ongoing administrative costs. With SonicWALL Hosted Email Security, no on-premises hardware or software installation is required. Safeguard email when servers are unavailable by spooling your filtered email messages if email servers are unavailable and then delivering them when the servers are back up. Simplify operations for managed service providers with central account management, flexible purchase options and automated provisioning for multiple subscribers. Email Security is easy to set up, easy to manage, and easy to own. Customizable, drag and drop dashboard, real-time and PDF formatted reports. Identify sources and senders of unauthorised email. Junk Box Summaries optimize end-user email productivity, reduce complaints and improve overall effectiveness. Provides cloud based protection from spam, phishing attacks and malware. Includes SonicWALL GRID Anti-Virus, SonicWALL Time Zero. Email spooling, per user junkbox, multi-LDAP server support. Comes with SonicWALL Dynamic 24x7 support. No on-premises installation required.